Dream with your eyes open Meet Daydream View. A virtual reality headset that's easy-to-wear with a controller that's simple to use. Next stop: anywhere Swim with seals, fly through space, and watch dinosaurs roam free - you'll be amazed at what you can do and see. Just a few of the many Daydream experiences available Hit the street and race supercars with Need for Speed. Get closer to the action with the NBA in VR. * Kick back with Netflix in your own personal cinema. Works with Daydream-ready smartphones, such as Google Pixel 2, Google Pixel, Samsung Galaxy S8/S8+/Note 8, Moto Z and Moto Z2. Share your virtual world Stream your experience to the TV with Chromecast to enjoy with friends and family. 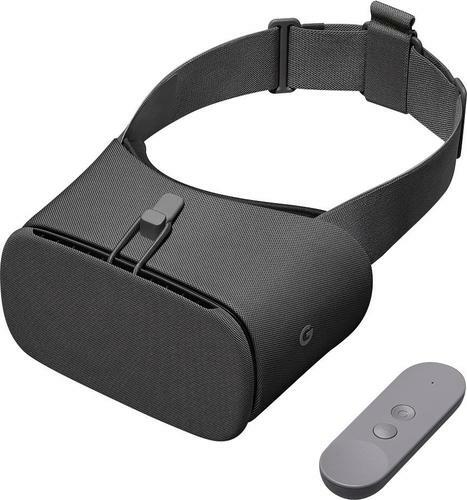 Play your favorite virtual reality games with this Google Daydream View VR headset. It's compatible with many smartphones, so you can enjoy videos for hours of immersive entertainment, and it offers up to 12 hours of battery life on a single charge. This Google Daydream View VR headset comes with a nine-axis controller for navigating games precisely. Mohon maaf, produk Google - Daydream View (2017) - Charcoal sementara ini sedang habis.